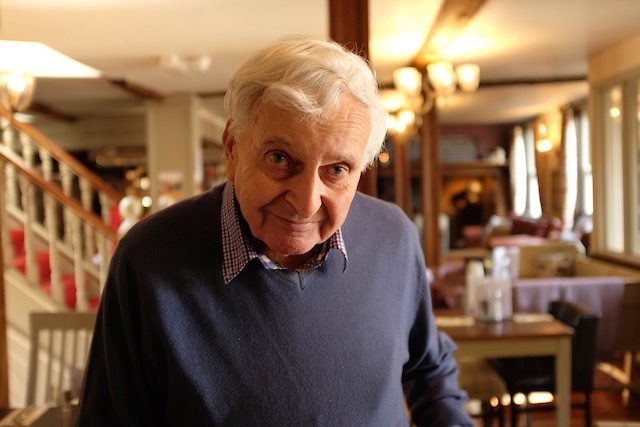 Douglas Botting, who died on 6th February, was the author of Wild Britain and General Editor of our Wild Guides series. You see him here soon after leaving Oxford, working away at his desk in Ship Alley, Strand-on-the-Green, Chiswick, in London. Starting out as he meant to continue! I first met Douglas Botting when I was editor of The World’s Wild Places series at Time-Life Books. It was 1972. We needed a replacement author at short notice for a book on the European wilderness. It required vivid personal narrative, but also a knowledge of geology, botany, zoology and other technical topics. What did he know, for example, about plate tectonics? ‘What I don’t know I can find out,’ he replied. He was confident, charming and persuasive so we took him on. He didn’t let us down. He wrote an excellent book entitled Wilderness Europe. 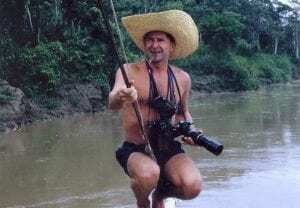 Festooned with equipment, Douglas Botting prepares for a shot in South America. We knew Douglas Botting had had an exciting and at times charmed life as an explorer, organizing an expedition to the almost unknown island of Socotra in the Arabian Sea, filming in balloons and almost getting killed – he was so intent on watching the ground coming up that the camera hit him in the eye – and journeying three times through the Amazon. But what impressed me was his flair and indefatigability as a writer. I discovered that in order to write the biography of Alexander von Humboldt he learned German. The sources in English, he explained, were just not sufficient. The work of an author falls into three stages: research, writing and editing. The first two are of course the hardest, and Douglas was outstanding at both. He explained to me the importance of taking proper notes when researching. If you don’t write down the full bibliographical details, including the title, publisher, date of publication and page number, you might never be able to find the reference again, and then you would be unable to cite your source or even quote the passage you’d read. He’d learned this lesson the hard way. The result was shelves of ring-binders full of notes neatly written on lined paper in Douglas’s beautiful hand. To research Wild Britain, the first in the Wild Guides series published by Sheldrake Press, he worked closely with his friend the naturalist John Burton. For each exploration zone they compiled complete species lists for the plants and animals found there, and Douglas drew on them as he wrote. Such was the wealth of this raw material, however, that it could never be included between one set of covers. In theory it could be made available as an online resource, to be consulted by naturalists, bird-watchers and other enthusiasts, and I have discussed this idea with Douglas. As publishers we have always wanted to gather it together and put it up on the web, and we do hope finally to do so when we publish the next edition of Douglas’s book. That way the depth of his research will be revealed and made useful. As an author with many distinguished books to his credit, all researched in this thorough way, Douglas not surprisingly encountered a storage problem of Byzantine proportions. A writer’s study can become a book and paper nightmare, but Douglas had some nifty ideas for avoiding paper mountains. When he took me round his final house, a converted school in Kingston, he showed how behind every wardrobe and cupboard stood tiers of cardboard storage boxes, sometimes double tiers, reaching up to the ceiling. In a smaller house you wouldn’t have been able to move, but here the rooms just got a bit narrower and you would hardly have known what was hidden away if he hadn’t shown you. To provide an escape from clutter, he had three writing sheds in his garden, one for nature, one for war and another for fiction. These provided comfortable dens for thinking and composing. Douglas Botting pauses for a photograph at home in Kingston, 2016. Douglas’s reception rooms were lined with books, but the shelves were always beautifully designed with pleasingly varied heights and alcoves for statuary and decorative objects. The whole interior gave you a warm feeling of a generous-hearted life lived to the full and enjoyed to the last. There were comfortable armchairs and sofas laid out in artistic combinations with coffee and console tables and the scene was one of inviting repose rather than overwork and stress. Douglas had an iron rule: never work past 9 o’clock, otherwise you won’t have time to cook and eat and relax before bed and you won’t sleep. Whatever his project, whatever the deadline, he maintained poise and pleasure in life. Writing a book requires singlemindedness. You have to hold the entire subject in your head as you work and you cannot permit distractions. Douglas’s method of achieving this was ‘deep filing’. Take a big cardboard box. When mail arrives, bung it in the box and forget about it. When the box is full, start another. When the book is finished and the manuscript is with the publisher, look in the boxes and see what’s there: tax demands, gas and electricity bills, junk mail all jumbled together, the impedimenta of everyday life both urgent and not – you can sort it out once the pressure is off. If you have to pay penalties for missed payments, it was necessary for the greater good of the opus. Once you’ve submitted a manuscript, you have to deal with meddling editors. They may have legitimate questions to raise, they may see structural deficiencies or they may just want to impose their own ideas, even their own style. 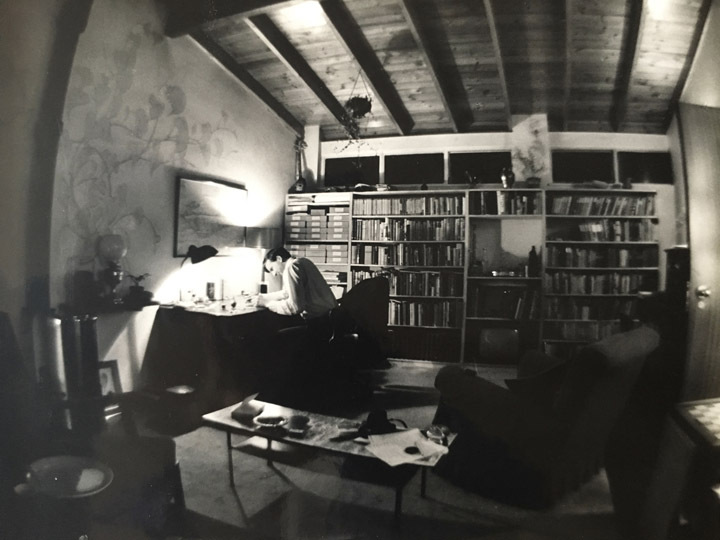 When I first went down to see Douglas in Kingston as a young editor, to discuss the editing of Wilderness Europe, I learned from him how to voice a piece of writing. Having done his research, Douglas was wonderfully adept at weaving fact and narrative, grammar and syntax, rhythm and humour, the formal and the colloquial to create an inspiring, often romantic picture in the mind’s eye. If I’d fiddled with one of his sentences, or added a new one, he’d show me how to refine it and balance it, how to choose an elegant expression over a coarse or plodding one. I never doubted he was right. He’d tell me how to word it and I knew instantly he’d formed it perfectly. It was a joy to sit together and make the sentences ring. It was a joy, too, to sit and talk about life and the universe and everything at the The Swan on The Ridgeway in Wimbledon, which he liked because they did a magnificent mixed grill. Knowing Douglas was an adventure, because he had a well-thought-out view about everything and was always full of ideas for exciting projects: books, films expeditions, new ways of enhancing life and the enjoyment of the world. Though he never made a big thing of it, he was psychically alert and intuitive to a rare degree. He sensed and knew things that most of us would miss, picking up presences, communing with other living beings. At horse races he would watch the steeds parading before a race and just knew which horse was going to win. He was making money from his bets. Then the punters noticed and started pestering him for tips, so he knew it was time to stop. The betting industry was not his first suit in life. 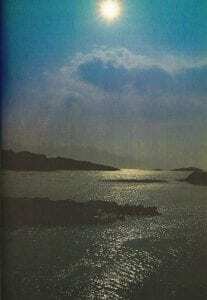 An opalescent sun burnishes the waves in the Sound of Sleat. ‘Thick fog had first delayed and then diverted my flight up to Inverness. By the time I reached Camusfeàrna on the west coast it was well past midnight – but an enchanted, breathless night of crystalline clarity. A brilliant full moon hung over the Sound of Sleat, casting a wan glow over the brooding hills of Skye and a glassy ocean that seemed to stretch motionless to the very edge of the world.